I am pretty sure I spent more time measuring this room than any other in our house! The reason? I really wanted a king-sized bed and this room is quite small compared to a new-build master bedrooms. The obvious wall for the bed was under the small windows, but because we made the room a bit smaller to have a walk-thru closet, the only spot for the bed became the wall which was shared with the closet. The bed faces the large floor-to-ceiling windows on the east side of the house, and we get some great morning sun; we love how it turned out! Our bedroom wasn't quite done (and still isn't!) when Kristen of K. Holly snapped some shots in here, but I still love how it looks in her photos. We've since added some Thedor prints above our bed, and a couple of orange polka-dot shams to break up on the all-white sheet look I had going on here. Here's an updated photo on the Facebook page to share the slightly updated (and more colorful) look. I know this room will continue evolving as time goes on - I'm actually still looking for something to put above the orange bookcase on the wall between the small windows and the floor-to-ceiling windows. There's a photo of it here as it is now, and I want to add a long frame (which I already have from my old office) with some art in it. Art is yet to be found! We LOVE this simple bed from West Elm. While shopping for a bed, we did search and search for a vintage one, but king-sized beds in the 50's and 60's were quite few and far between in Michigan. I couldn't find anything I LOVED, so instead, after much debate, I ordered this one from West Elm. 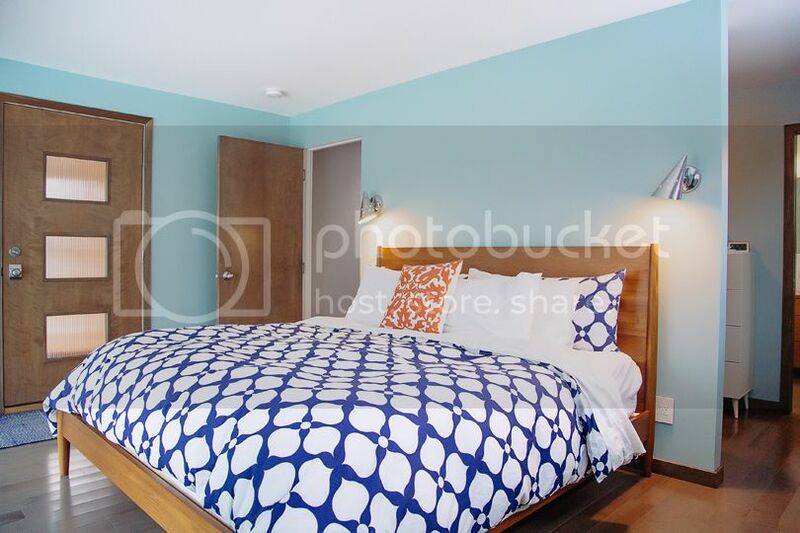 The wood color is perfect and I really love that we have a headboard and footboard; this room with minimal furniture seems more finished to me. Past the bed, is the walkway thru the closet and into the bathroom. 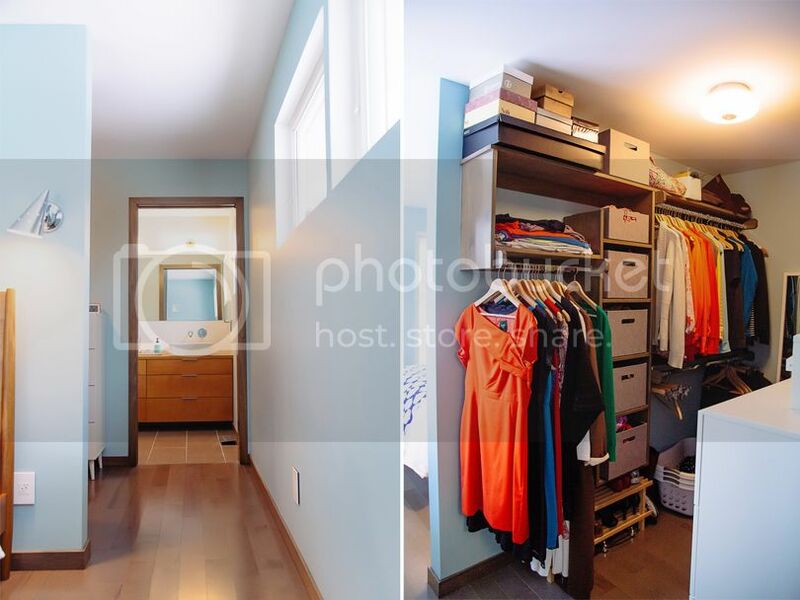 Originally, there was just a standard closet here with large, mirrored doors and no access to the bathroom. Our closet is about 6' wide - large enough for us to both have our own side. I took the side with the long portion so my dresses would have a spot. Ideally, we'd have built in drawers in the cubbies, but for now, the ones I picked up at Target work just fine. Greg's side is almost the same, except instead of the long portion for dresses, we found a little white dresser for all his t-shirts and boxer shorts. We couldn't make the wall organizer any longer because the pocket door is hidden in that wall! 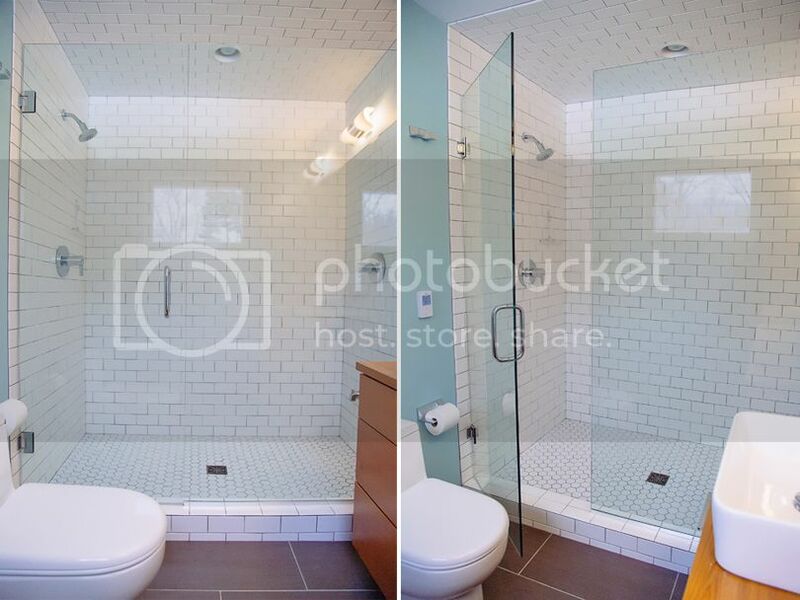 Another small-for-2014 room is the master bathroom. It's about 6.6' wide, but perfect for a double vanity, toilet and double shower. The vanity is exactly the same as the one in the hall bath - they both have faux drawers up top, and the second drawer down is cut to fit around the plumbing, and then the third drawer provides the most storage space. You might notice we don't have a linen closet in our bathroom - there really wasn't any more room - so our towels are in the guest bath and we just grab one before showering. It isn't a huge deal and keeps everything in one spot when I put laundry away. We are very happy with how this portion of the house turned out. We don't hang out in our bedroom very much, so having a smaller room was just fine for us! This space looks amazing! 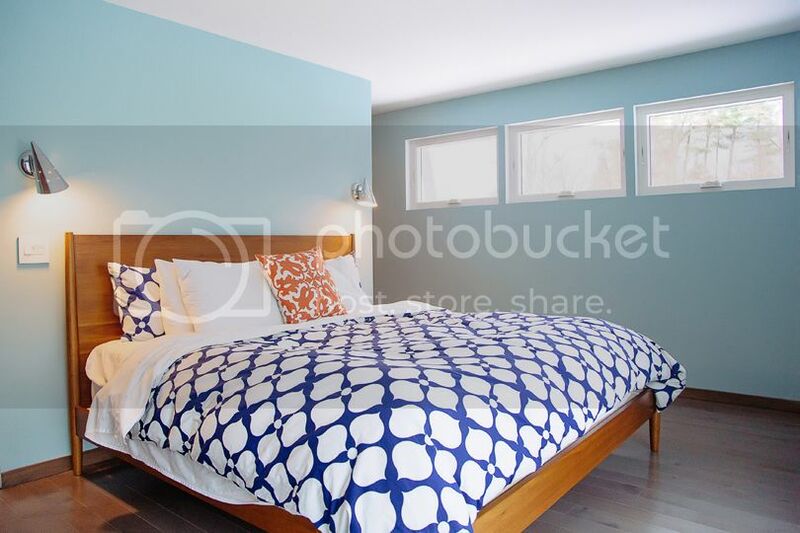 If you don't mind my asking, how have you liked the king size mid-century bed from West Elm? I'm currently bed shopping and this is the one I've got my eye on but I can't really find any reviews of it online and I'm worried it might not be as sturdy as I would like for the price tag. I'd love to know your honest experiences with the bed, good or bad. We absolutely LOVE our West Elm bed! We've had nothing but a good experience with West Elm in general, and the bed is no exception. I ordered it online, and they scheduled delivery. I actually had to keep pushing it out because our house was NOT ready for furniture yet, and they were very accomodating. I'd highly recommend this bed!